If the two weeks prior were a storm, this past week has been the calm. Spring is finally coming, and the spring flowers are blooming everywhere. Easter that seemed so far away is now just around the corner. As I was leaving lunch on Thursday with a couple of friends, I got a message from another friend who lives nearly 2 hours from us. Her 85 year old friend, Ginger, had a sick 30 year old (!!) 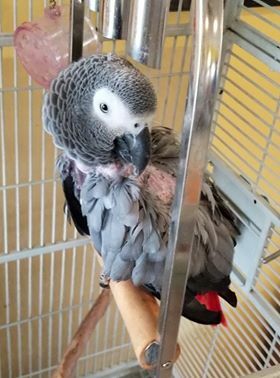 African Grey Parrot named Ziggy that was being cared for at a nearby vets office. Ginger was understandably really worried about her and was unable to drive herself to even see Ziggy, (who was brought to this particular vet by someone else). Ginger was told by the vet that Ziggy, who was now on medication and feeling somewhat better could come home if she'd just eat on her own. Ginger was sure that if Ziggy just had her favorite food that the vet couldn't (wouldn't?) provide for her, it might just do the trick. Ginger was feeling really depressed and defeated because she knew of no one to ask for a favor, and so asked my friend if she did. THIS is where I came into the picture. My friend knew it was a lot to ask, but she wondered if I wouldn't mind going to the grocery store and buying for Ziggy, 2 RED apples, RED grapes, and 1 banana all of which are her favorites and taking it to her at the vets office, adding that they would pay me back for the gas and the fruit. Of course I said I would and told my friend that if they gave me anything for what I consider a small favor, I'd be insulted. So off to the store I went, and I dropped it off, also hoping it would tempt Ziggy to eat, and happy that I was able to help someone out. 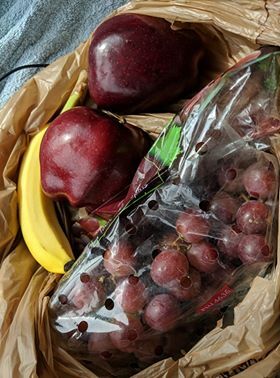 My friend sent me a message telling me that Ziggy immediately ate some of the fruit. And today I received another message that Ziggy was able to come home! Adding that Ginger is so happy and that the first words Ziggy said to her were "Are you hungry? At hearing those words, Ginger said she cried. She was even cleaning her feathers, which Ginger says is a good sign. Ziggy, who she has had since she was a very "young chick" now has special food and meds for a liver issue and all are hopeful she will be okay. At the moment, we're all "okay" too. 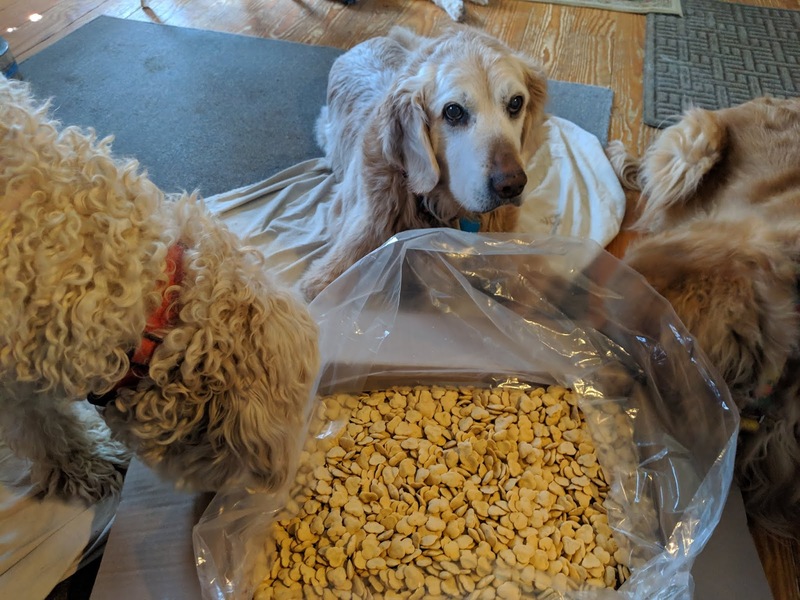 It has been a pretty good week for Bailey, (in the middle below) as well the others as I opened up a new 12 pound box of dog-treats today. For us, it's of course more cost-effective to buy them this way and I'm grateful that the shop where we buy their food will special order them for us. And I was sure to give a few extra to Rhett who was a good sport and let me put the ears and petals on him to take a few "seasonal" photos. Todd is enjoying the seasonal change and is really enjoying spending more time outdoors. If spring has come to your corner of the world, I hope you are too! sending you and your crew love and blessings! Hello, Happy Easter to you all. I am so glad this was a good week for all the cute furbabies and for Ziggy! Enjoy your Sunday, have a great new week ahead! 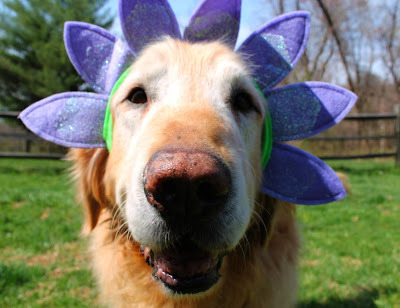 Spring is looking beautiful there, and how wonderful of you to do that special favor to help out Ginger and Ziggy. You're the best! We are so happy Ziggy is doing better. We used to buy treats in bulk when we had multiple dogs too. I often miss those days, even though having one dog is a bit simpler!! Actually 30 is not old for an African Grey. I had one for 24 years and she was old when I got her They can go 70 years easily. Ziggy will probably outlive Ginger by many years. I knew that parrots could live very long lives, but had no idea what that was. Thank you for letting me know! And how wonderful that your African Grey live a long life, a tribute to your devotion and care, I have no doubt! It was nice to meet Ziggy. My joanna human's room mate has an African gray parrot named Echo. They're pretty smart birdies! Thank you for telling us about Ziggy. I'm glad she's feeling better. We had a 28 year old Cockatiel named Buddy who chatted with me every day. I miss him. Glad to hear that all the dogs are doing well, too. It's good to hear Ziggy is back home most likely due to your generous favor. How sad that the vet couldn't go out and pick up a few simple fruits to get the bird to eat. We're glad to hear all is going well at your home this week too. Well done! It feels great to be able to help, doesn't it. You don't need any other reward. Glad Ziggy is back home and eating and talking again. Hope he has another 30 years. You are such a kindhearted and loving person to get that fruit for Ziggy!!! We had no idea that parrots could live that long. We just got a new feathered family member, and Mom hopes she can keep him healthy for a long time too. I have been away from Blogger for a month and so missed your posts. I am glad to come back to read this one. Your kindness touches my heart so much. You have brightened my day immensely with this post, just when I most needed it. Thank you for all you share. These pictures are pure joy. I'm so happy you made both Ziggy and his mom happy. Isn't it wonderful when you can spread happiness around like that? 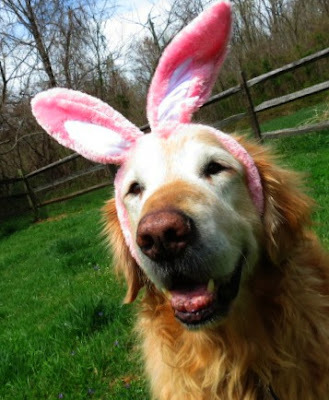 Happy Easter, my friend. You are a five-star friend, Kim. How nice of you to help out. This post is so happy and beautiful! Happy spring...!! Happy Easter! Happy new day!